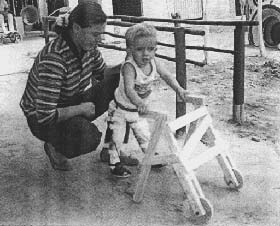 RAÚL was nearly 2 years old and still could not walk. His parents were increasingly concerned about his deformed feet. He had been born with club feet that twisted inward so far that they pointed backward. His lower legs also turned inward, and his knee joints were very loose. First, the doctors had casted his feet to try to correct them (serial casting). Next, they did surgery. Neither helped much. There was so much muscle imbalance that the clubbing quickly returned. Raúl was then given long-leg braces with a hip band, in an effort to hold his feet straight forward. But still his feet twisted in and down. He could not stand or walk, with the braces or without them. Frustrated by the failure of casting, surgery, and bracing, the family made the long journey from their home town to PROJIMO. 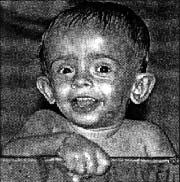 Raúl was then 1 year, 9 months old. Raúl was a delightful, friendly curious little boy. But he was so used to painful medical exams and procedures that as soon as his mother started taking off his shoes at PROJIMO, he burst into tears. It took the team days to win his trust enough to comfortably touch and work with his feet. A trusting relationship between the boy, his parents, and the team would be essential if a solution was to be found. A lot of close interaction and experimentation would be needed. On examining Raúl, the team found that his feet and ankles could be twisted by hand into a nearly corrected position. His heels were fairly straight. But strong muscle imbalance and contractures would make it hard to brace his feet in a good position for standing or walking. More surgery, with tendon transplants, might be needed later on. But first, Mari thought, another attempt should be made to straighten his feet with a series of plaster casts. "He didn't get braces soon enough after the first series of casts, and the deformities returned," explained Mari. "So we need to use casts again, and keep him well-braced afterwards." "How long would the casting take?" asked his mother, doubtfully. "At PROJIMO, it will take maybe 6 to 8 weeks," said Mari. "But, if it's done at a clinic in the city, probably much longer. It's usually faster here, because we modify the casts every 2 or 3 days, not every week or two." She laughed. "Our work is more labor and love intensive!" "But we can't be away from home that long!" said Raúl's father. "We have other children at home. And we both work... Isn't there some other way?" "I don't want another long period with casts for my baby," said Raúl's mother. "Last time, he cried day and night for weeks. It was torture! ... Isn't there some other way?" From this discussion came the idea of "another way" to gradually correct the contractures and inward twist of Raúl's feet, and to get him standing and walking earlier. "We'll try!" said Mari. Because serial casting at PROJIMO was not acceptable to the family, PROJIMO's brace maker, Armando (who is also disabled), designed adjustable plastic braces that could gradually stretch Raúl's club feet into a more functional position. The brace needed up-and-down flexibility at the ankle, with a mechanism to gradually stretch the tight heel cord and correct the downward, tip-toe contracture. But the brace also needed sideways stability at the ankle, to prevent the foot from doubling inward. 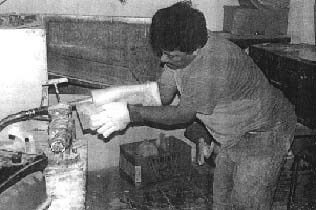 To provide this vertical (up and down) flexibility and lateral (sideways) stability, Armando modified the plaster mold of Raúl's foot to form a transverse (sideways) bar at the back of the ankle. 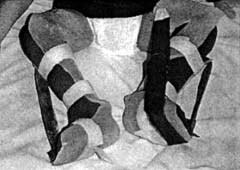 A band of rubber inner-tube was stretched between small holes at the top and the toe of the brace to provide a gentle but steady upward pull on the foot. The force of pull could be easily adjusted by pulling more of the tube through the tightly-gripping hole. The effect of this steady pull was similar to serial casting. But, instead of changing the cast to gradually correct the position of the foot, all the family needed to do was to tighten the rubber strap. Using his braces in a standing frame. One of the purposes of these below-the-knee braces was to help Raúl begin to stand with his feet in a good position. If the braces worked as planned while he was standing, the weight of his body on his feet would help to correct his tip-toe contractures. To start Raúl standing with his legs and feet in a good position, Polo made a simple wooden standing frame for him. He added a V-shaped leg-separator to hold his feet somewhat apart, and his toes angled slightly outward. Upon trial, Raúl's loosely-jointed knees opened in a bow-legged stance. So it was necessary to add straps to hold his legs straight. 1. 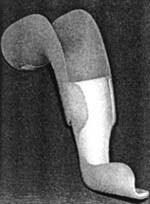 When he was not standing on them, the downward push of his fore-foot caused the brace to slip down his leg, lifting the heel of his foot off the heel of the brace, thus leaving the tip-toe deformity uncorrected. 2. When not standing on the standing frame, which held Raúl's feet with the toes angled forward correctly, muscle imbalance caused his feet to rotate into a pigeon-toed position. To keep the night-braces from slipping downward, these braces were designed for use with knees bent. 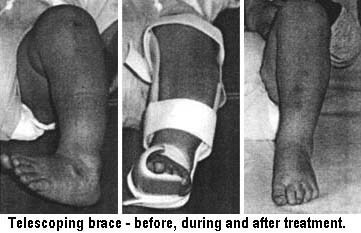 A strap from the toe of the brace was stretched up over the thigh. This both stopped the brace from slipping downward, and reinforced the corrective action. Every time Raúl tried to straighten his knee, the strap would pull the brace more forcefully against his fore-foot, giving an extra corrective stretch to the tight heel cord. 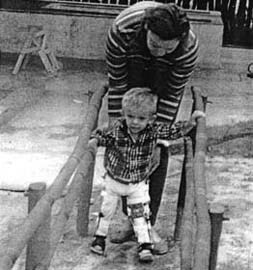 To prevent Raúl's lower legs and feet from rotating inward, the plastic night brace was made with a medial (inward-side) extension above the knee, which rested against the inner side of the thigh. With the knee bent, this thigh-flap prevented the lower leg and foot from rotating inward. The back edge of the thigh-flap had a narrow notch to hold the elastic thigh-to-toe strap in position. To make the thigh-flap, first the plaster mold of the lower leg was extended by tying a section of plastic bottle to the top of the mold, and filling it with plaster (see photos, page 102). This allowed a plastic brace to be molded with an extension above the knee. The extension was cut free from the lower-leg brace, except on the inner side. The upper, broad ring of plastic was then heated (with a heat gun), and opened out to form the thigh-flap. 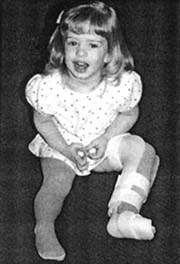 The first night's trial of the deformity-correcting braces was at PROJIMO, soon after the braces were completed. To everyone's delight, Raúl soon fell asleep, with his legs and feet in the corrective position and the inner-tube bands gradually stretching and improving the deformities. For Raúl to be able to stand by himself and begin to walk, it became apparent that he needed full-leg braces, with a hip band to keep his feet in a forward position. With the below-the-knee braces (AFOs), his feet turned in a lot, and his knees bent sideways and backwards. Mari felt it was important that Raúl begin to walk without further delay - if possible, even while his foot deformities were being corrected. (With feet fairly well-aligned, the weight of his body could help to correct the contractures.) Because his knees were so unstable, Armando thought Raúl needed long-leg braces. So he added knee joints, plastic thigh supports, and a hip band to his below-the-knee braces. 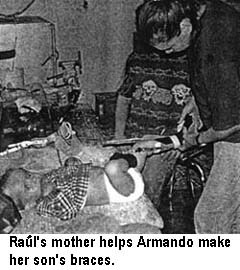 Raúl's mother helped Armando to make and fit them. They had them ready for trial in 2 days. After early trials, and some complaints by Raúl, adjustments were made to the length of the braces and angle of leg separation. At last Raúl was happy with his braces. With his new braces, first Raúl tried walking between parallel bars. Then he experimented with a wooden walker that Polo, a village youth, had made for him. The child's first steps were difficult, but little by little he overcame his fear. After a while he began to walk with the walker on his own. Both Raúl and his parents were delighted. Eventually, Raúl will need further surgery. But, thanks to the corrective action of two sets of braces (one set for standing and walking, the other for night use) any surgery he may need will be less extensive. 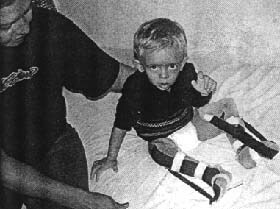 Most important, Raúl has been able to start walking and exploring his world in an upright position, even while his deformities are being corrected. That gives him a head start. 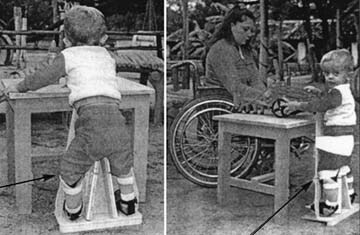 Equally important was Raúl's change in response to the management of his disability. When he first came to PROJIMO, he was terrified. But after a few days of interacting with Mari, Armando, Cecilia, and Polo - who treated him as a person, not a patient - Raúl began to enjoy the whole process. He would lift his feet and point to them, smiling. For a child his age (under 2 years old), Raúl's cooperation and enthusiasm were amazing. Everyone fell in love with him. When the PROJIMO team invented the plastic brace with a bent knee to straighten Raúl's in-turned feet, they were unaware that, in the United States, a somewhat similar brace was already available on the commercial market. It goes under the name of the Denis-Browne Telescoping Brace. It is available, pre-made, in different sizes, from AliMed Inc., Dedham, MA 02026, USA. The cost is more than US$100. We include the design here because it is in some ways better and easier to use than PROJIMO's bent-knee design for Raúl. The telescoping brace is made of two molded-plastic pieces. The upper piece holds the knee at a right angle (90 degrees). The lower piece holds the ankle and foot. The two pieces are held together with Velcro (self-stick tape), so length and angle can be easily adjusted. The main advantage of the telescoping brace is its adjustability. The length can be changed for different children, or for the same child as she grows. The angle of the foot in relation to the lower leg bone (tibia) can also be changed. Thus, a foot that turns in due to clubbing or "tibial torsion" (a twist in the lower leg-bone) can be slowly corrected by gradually rotating the lower half of the telescoping brace. The photographs on this page are taken from the AliMed Catalogue, with permission. 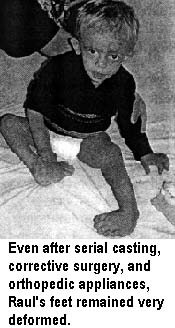 To make Raúl's braces, first plaster casts were made of his legs. Then solid molds were made by filling the cast with plaster of Paris, as shown below. 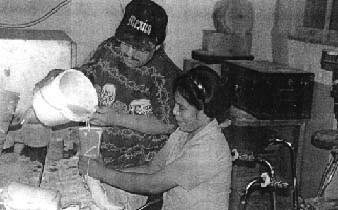 Rosaura, who is paraplegic, helps Armando make a mold for Raúl's braces (see page 99). Armando stretches a sheet of hot polypropylene plastic over the mold of Raúl's feet. Positioning the feet correctly while casting them is often difficult. The next chapter demonstrates a device that makes positioning of the foot while casting much easier.